It's a Tad Windy Here! This morning dawned a bit dull, and once again, very blustery so we put off going out until after lunch time, and then we decided to head off walking up into the hills to see a bit of the interior of the nature reserve. A short distance from the camp site there is a paved road that leads up towards the abandoned village of Cortijo Los Berengueles. Initially, we'd thought we may be able to cycle, but it was a good job we didn't because the paved road soon gave way to a track that would have been impossible to traverse on bikes because it was an old river bed that had a deep sandy bottom - much of which ended up in our boots! We followed the track for a couple of miles and initially came across the villages old water well, which resulted in me being told off! The well was fenced off, but of course I wanted to know how deep it was, so I crawled under the fence to drop a pebble in - John didn't approve! And it must have been quite deep because it was a long time before we heard the pebble strike the bottom - good job I didn't follow it! 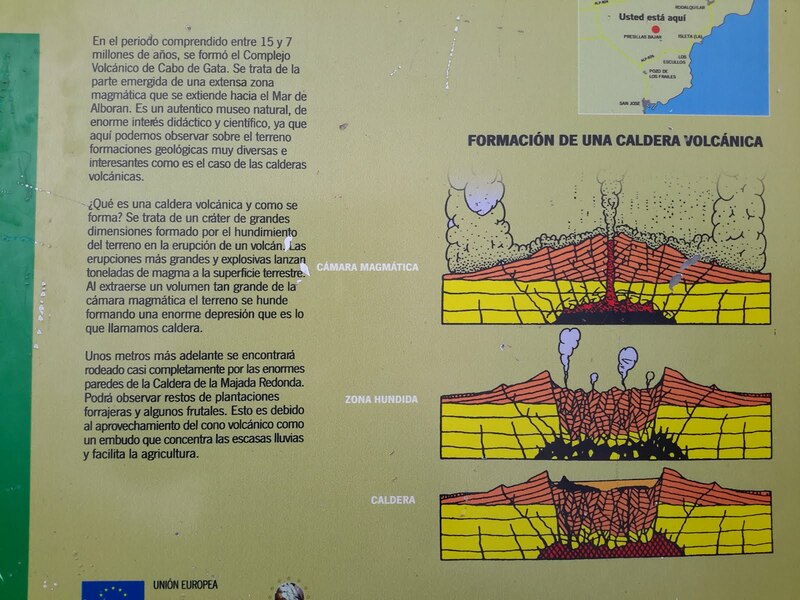 As it hadn't taken us long to walk up to the village we pushed on a bit further along 'The Rambla' (way marked path), because we knew there was a volcano crater where the path finished. However, when we got to the end of the trail there wasn't much evidence of the crater other than the sign board below explaining it's geology, and also more tall soaring sandy volcanic hills that dwarfed us from all sides. Since we arrived at the camp site of Los Escullos, with the exception of one day, the wind seems to have been a fairly permanent companion to us. However, this morning it had abated a little, and following John's usual check of the weather forecast we thought we'd be fairly safe to go out on our bikes, mostly because the gales weren't predicted to resume their batterings until later in the afternoon! WRONG! It all started well, our bikes were released from their tether on the back of the van, picnic was made, flask was filled and we were off cycling towards Las Negras - a village about 12 kms further along the coast. Now, at this stage, the wind was behind us so it gently pushed us along the quiet roads, both uphill and down dale - it really was a bit like being on a roller coaster - but with only two really steep sections to make us huff and puff. However, for both steep uphill climbs there were also the matching down hills, and it was lovely to free wheel, but I did become a little concerned when I noticed that my bike computer was registering 43 kilometres per hour! It took us a little over an hour to reach our goal, and when we did we found a lovely little cove with quaint Spanish bars and traditional cafes lining the water front, but as usual we'd brought our own goodies so we sat on the beach (picture below) and scoffed them while watching the waves washing up onto the shingle. After lunch we were a bit undecided weather to go home or continue our explorations as the wind did seem to be picking up again - but it was still quite early and it wasn't to bad so the latter won out. We'd read about another beach at El Playazo which was identified as being one of the Nature Reserves' prettiest - and it didn't let us down. The beach itself was quite beautiful, and could only accessed either on foot, or down a long winding narrow concrete road, therefore, despite it being Sunday, it was quite under populated. But, quite interestingly, there were a number of motorhomes that looked as if they were enjoying this lovely setting for more than just one day! - we've added it to our possible destination list for the future. By now the wind was becoming a little more ferocious, and as we'd already identified a view point where we'd like to stop for our afternoon coffee, we didn't linger too long. However, it was at this stage that we realised we were going to struggle, because now we were peddling straight into a very strong head wind, and I'm sure this almost doubled the effort needed to progress forwards, so when it came to going up the hill just before our planned stop we had no choice but to get off and push! Our new trusty steeds! Not quite fully personalised, but getting there! Again, we didn't pause for to long over our coffee, but just long enough to eat a chocolatey treat and take a few photos before resuming our journey. But again the wind had strengthened, and now it was just like riding into an upright trampoline! And we hadn't gone far (down hill) when a huge gust whipped my helmet off and seemed to pick me up and move me into the ditch at the side of the road. Luckily I didn't quite fall, but to say I was frightened was an understatement - I really thought it was going to bounce me right over! However, we still had about 8 kms to go so there was no choice but to get back on and continue, very carefully, on our way. We eventually arrived back at the T4rdis safe and sound, but almost completely knackered from battling the storm force gale. Our post arrival cuppa was more than welcome, and we weren't surprised when we later read that the wind speeds had been gusting to 100 kilometres an hour- it was little wonder that we'd struggled so much! Anyway, after all that we decided to reward ourselves with a lovely dinner of roast duck, and off course, a nice little drop of red to wash it down. Well, what a night - the wind if anything, seemed to get worse, and as it howled all night, the van rocked, and every now and again you could hear things being chucked about outside! Luckily, when we peered out in the morning there was no damage done but we were extremely glad to have been in our sheltered spot within the campsite. Also, originally we'd planned to move on today, but as the forecast was for more of the same lasting for most of the day, John didn't fancy driving. Therefore, as we'd no pressing engagements, we decided to stay put. So, the day was spent quietly reading, blogging and not doing much, but to prevent cabin fever, we did decide to take another battering and potter down to the beach to watch the waves rolling up on to the sand and splashing against the rocks! We were also quite fascinated to see the stormy clouds passing over the cliffs in the background, and we jokingly argued as to the likelihood that they would drop another deluge of wet stuff - but they never did! Today was moving day and it dawned calm and sunny - happily the wind had abated completely so packing up from our week long stay didn't take very long at all. Our next destination was to be the sea side town of Nerja, but on the way we'd decided to stop off at Playa de Cabo de Gata where there are some salt lagoons, which are often occupied by flamingos. To get there we had to drive through another green house city, but it was well worth it to see the miles of sandy beach and the lovely little town of La Almadraba de Monteleva where I decided to take some time to improve my fitness! From here a lot of our journey turned out to be on motorway, but even so, much of it provided stunning coastal views, and it should have been quite an enjoyable journey - that is if it hadn't been for the constant nagging of Mrs Snoopy (sat nav). Some of the road was new and therefore not on her maps, and some of it was through long tunnels (the longest being over 2 kms), so for much of the way she seemed to think we were driving over cliffs! This caused her to become quite distressed, and she dinged and donged almost constantly as she tried to warn us that we were off track, and she certainly wouldn't listen to John when he said he knew what he was doing! So in the end he had to switch her off - not something he can usually do when a woman is nagging him! We stopped for lunch right beside the ocean, and then it was off to Lidl to replenish our rations, before moving into Camping El Pino in the town of Torrox near Nerja where we'll spend the next few nights. The morning dawned warm and sunny so we decided to cycle along the coast into Nerja to revisit The Balcon de Europa. We cycled from the campsite down a steep and twisty lane to reach the sea front, and from there we followed the coast, initially on road and then mainly on promenade until we reached our goal. The Balcony is situated on a rocky promontory that was formerly a fortress designed to deter pirates, but now it is the focal point of the town and it affords magnificent views, to the left towards the village of Maro and the Nerja caves, and to the right you can see numerous little beaches and coves. The balcony itself is lined with numerous eateries and it was a hive of activity with lots of people taking photos and basking in the warm sunshine, but as usual we had our picnic with us, so after a little look around we nipped off to find a quieter spot for lunch, and while we were at it we did our own bit of basking in the sun as well! Then, following our rest, we explored a little more and visited Torrox Costa where we found another pretty promenade along with the remains of 'The Factoria de Salazones y Necropolis'! Sounds fairly disgusting - I wonder what they used the sauce for! There were also a lot of tempting bars along the prom and we did wonder weather to stop off and have a refreshing little drink, but we decided that could be saved for another day, so we just wandered back to the T4rdis to catch a few more rays. At the moment we're a bit undecided about how much longer we're going to stay here, because although it's very pleasant, the pitches are 'tight' to say the least - we almost needed a shoe horn to get the T4rdis in, and escaping might be interesting. Additionally, one of our main ambitions for the near future is to obtain tickets to walk 'The King's Little Pathway' at El Chorro! We've been trying to get them for several days, but at present they're sold out, however we remain hopeful that there may be some cancellations! The Spanish title is El Caminito del Rey and the trail takes you along a suspended walkway that is pinned along the steep walls of the narrow gorge of El Chorro. It looks very vertigo inducing, and in times gone by it was labelled 'the world's most dangerous walkway', which resulted in it being closed to public access. However, in recent times it has undergone major renovations and it was reopened in 2015, so fingers crossed we'll be able to see it in the flesh for ourselves, but if we don't manage it this year it will be a good excuse to come back! Anyway, in the end I think we've decided to stay another day, so for now I'll wave goodbye 👋👋👋 and get on with planing what we're going to do tomorrow!